Is your studio website a fancy online business card? Ruthie owns a studio in Southern California, where she teaches piano, voice, ukulele, and preschool music. Ruthie is having a huge year: her studio is about to be featured in a local tv segment that will reach well over a million local viewers in San Diego. The segment was filmed this summer, and Ruthie wisely decided to have a new website built before the segment is aired so that she is prepared to handle the traffic she receives. Ruthie offers seven unique programs in her studio. She wanted clear descriptions of each program, a clean overview of everything she offers, and easy enrollment for new students right there on her website. For studio management, Ruthie wanted to have a way for current families to log in to her client system (she uses My Music Staff) and stay up-to-date on studio events. Ruthie is not alone in these goals. Increasingly, you as teachers are wanting more from your studio websites. Gone are the days when a studio website is simply a fancy online business card; studio websites now have far more potential than that. So how do you use your studio website for both studio growth AND studio management - without compromising the quality of your website or confusing parents? Start with your primary goals and make everything in your website support those goals. We wanted for parents arriving at Ruthie’s website to easily find relevant information while also being immersed in a beautiful website experience. When a prospective parent hovers over the “Lessons” drop-down menu, they will find all of the information they will need to get started with lessons. When a studio parent hovers over the “Current Students” drop-down menu, they will find all of the tools they’ll need to stay current with studio events and details. Meantime, Ruthie's homepage features large, stunning photos of her engaging with her students. Her colors are warm, and her image is both welcoming and professional. 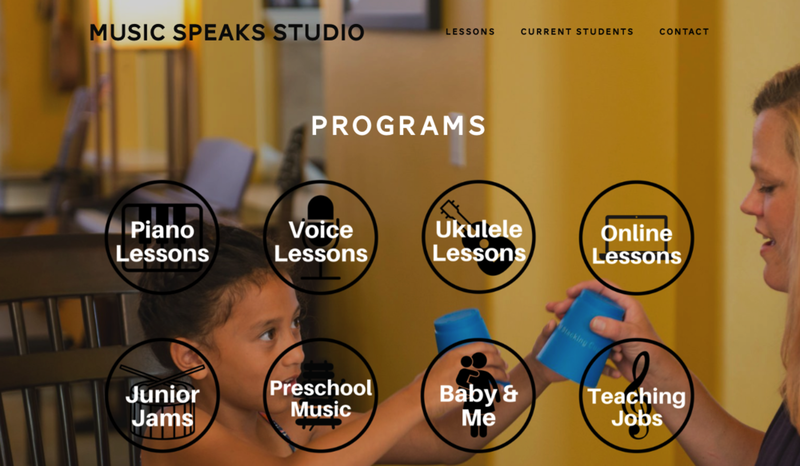 When a prospective parent arrives at the “Programs” page, they can see at a glance what programs are offered at Music Speaks Studio. We created this menu at Ruthie’s request, and it was a smart detail that helps accomplish the goal of taking parents to their destination as efficiently as possible. One of my favorite features on Ruthie’s website is this “Get Started” block. It appears a number of times throughout her website and makes it super easy for a parent to enroll. This is a particularly smart feature given the amount of traffic her website will receive in the next few weeks. 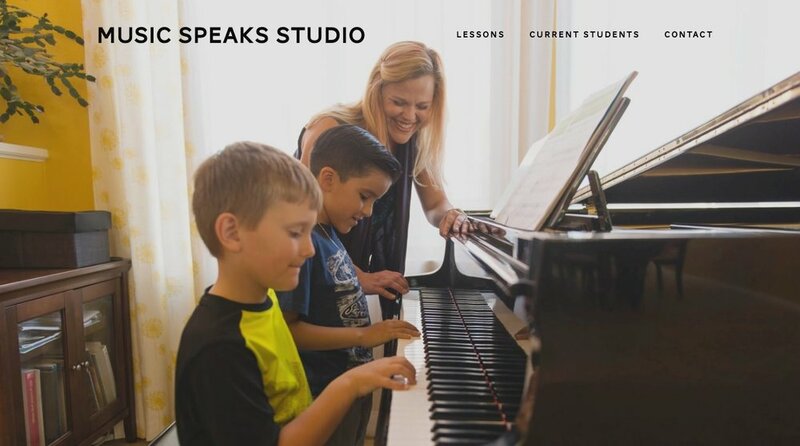 Ruthie also wanted a way for families to purchase online lesson packages on her website (a feature that’s ready to go live once she launches this program). And speaking of launching new things, Ruthie was able to build an additional page on her own after receiving her website tutorial! Are you ready to double your website’s power? Take a look around Ruthie’s website and choose an element or two to incorporate into your own website. 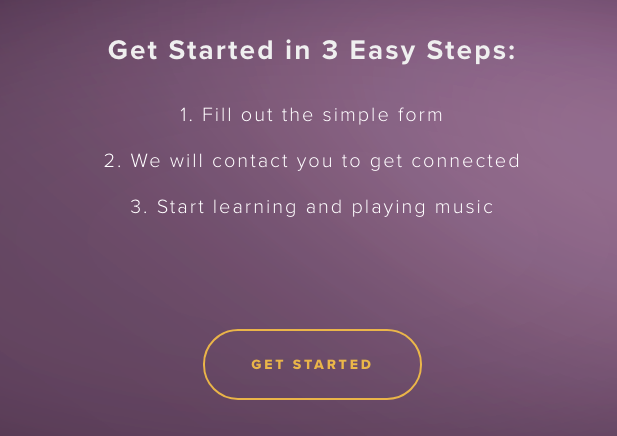 Joining My Music Staff and adding login and enrollment widgets to your website? Redesigning your navigation bar to help parents reach their destination quickly? Organizing your program pages so that parents can easily find the information they need? Adding convenient buttons throughout your website to jumpstart the enrollment process? Whatever you decide to do, I hope that your website becomes more and more powerful with time. Please let me know what changes you make - and the difference they make in your studio!